The 6.6L Turbo Diesel V8 Duramax LGH is an engine produced by General Motors for full-size heavy-duty (HD) vans. Displacing 6.6 liters in a V8 configuration, the LGH is part of the Duramax engine family of turbo-diesel engines initially created in partnership with Isuzu. With nearly 1.3 million Duramax diesel engines in operation no other automaker has as much diesel engine development experience in meeting the demands of the heavy-duty truck customer as General Motors. 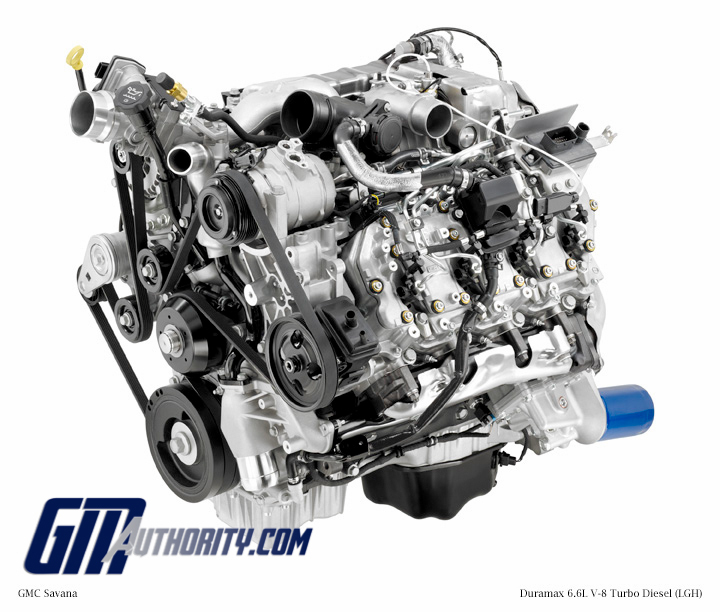 The Duramax 6.6L turbo diesel engine is strong, powerful and efficient. Features such as common rail fuel injection and aluminum heads with a six-bolt-per-cylinder design has helped cement the Duramax’s foundation years ago and continues to make the Duramax diesel a relevant product. Cylinder Block and Rotating Assembly: the Duramax block features casting enhanced to support smoother and quieter engine operation. It uses a strong cast iron foundation known for its durability, with induction-hardened cylinder walls and five nodular iron main bearings. A die-cast aluminum lower crankcase strengthens the engine block and serves as the lower engine cover, while also reducing the engine’s overall weight. Working within the cylinder block is a robust rotating assembly that features a forged steel crankshaft, forged steel connecting rods and forged aluminum pistons. The crankshaft is surface-hardened by nitriding, a process widely acknowledged as the most effective means of limiting wear and ensuring durability. Pistons: the pistons are redesigned without pin bushings to reduce reciprocating weight, which helps the engine rev quicker and respond more immediately to throttle changes. The connecting rods that are used with the pistons feature a smaller-diameter pin bore on the small end to support the strengthened pistons. Piston-cooling oil jets are located at the bottom of the cylinder bores and spray engine oil on the bottom of the pistons. The extra lubrication cools the pistons, reducing friction and operational noise, while also bolstering the engine’s durability. Cylinder Heads: the Duramax diesel features an aluminum cylinder head design, with six head bolts per cylinder and four valves per cylinder. The aluminum material of the heads helps reduce the engine’s overall weight, while the six-bolt design provides exceptional head-clamping strength – a must in a high-compression, turbocharged application. 2000-Bar Fuel System with Piezo Injectors: the Duramax uses a common-rail direct injection fuel system. Piezo injectors allow a more precise metering of the fuel, especially for very small quantities of injected fuel, which leads to a smoother idle and lower combustion noise. Variable Geometry Turbo charging System: a variable-vane turbocharger is employed on the Duramax 6.6L. With the variable-geometry turbocharger, the engine delivers more power with lower exhaust emissions and no decrease in overall fuel efficiency. The system uses self-adjusting turbine vanes and sophisticated electronic controls to automatically adjust boost pressure and exhaust backpressure. Emissions and Particulate Control Technology: The Duramax diesel features the latest in emission control technology, making it the cleanest Duramax engine ever produced, with NOx emissions reduced by at least 63 percent in the LML version. B20 Biodiesel Capability: the LML version of the Duramax 6.6L turbo diesel is capable of running on B20 biodiesel, a fuel composed of 20 percent biodiesel and 80 percent conventional diesel. B20 helps lower carbon dioxide emissions and lessens dependence on petroleum. It is a domestically produced, renewable fuel made primarily of plant matter — mostly soybean oil. Cooled Exhaust Gas Recirculation (EGR)"
Recommended oil-change interval: Per the computerized Oil Life System (requires CJ-4 Engine Oil to Maximize Life)"